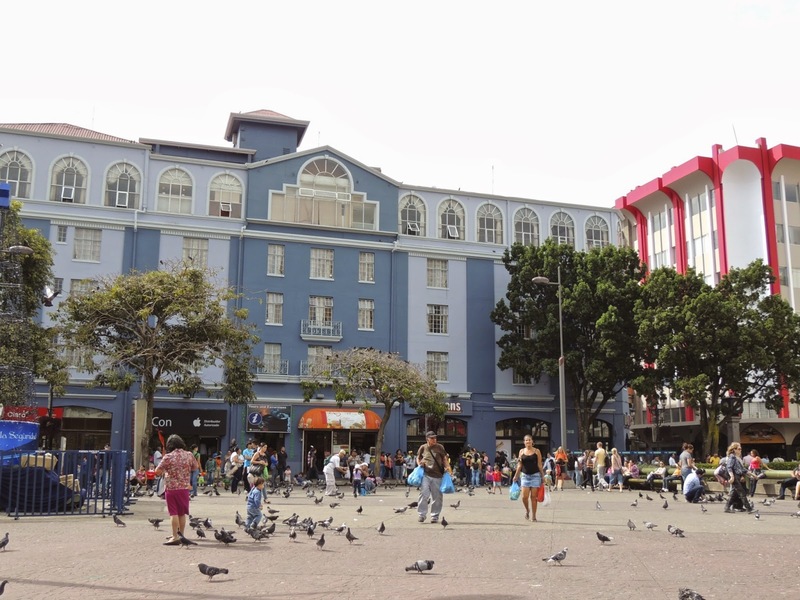 This photo shows a plaza located next to the National Theater. The most notable aspect of this plaza is what is underneath it, which I will show in the coming days. Downtown San Jose is not considered a major draw for tourism. The architecture of the city center is primarily that of a 20th Century business district, not a charming Spanish colonial town. That is because San Jose was not a major city during Spanish Colonial times. 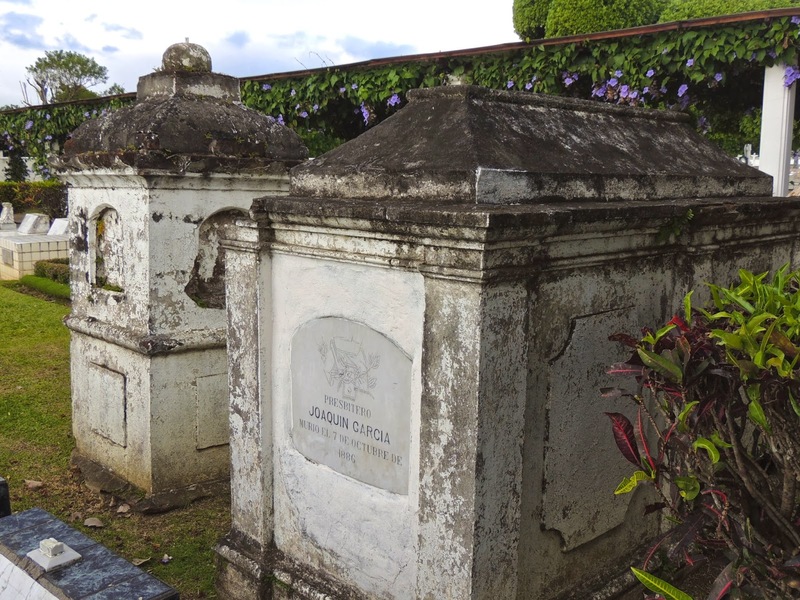 The Spanish largely ignored Costa Rica after they determined that it lacked large deposits of gold or silver. They did not build major cities with architectural features that would draw tourists today. Instead, the local population was almost wiped out by disease, leaving a country that developed through small farmers growing fruits, vegetables, coffee and, beginning in the late 1800's, large banana plantations. 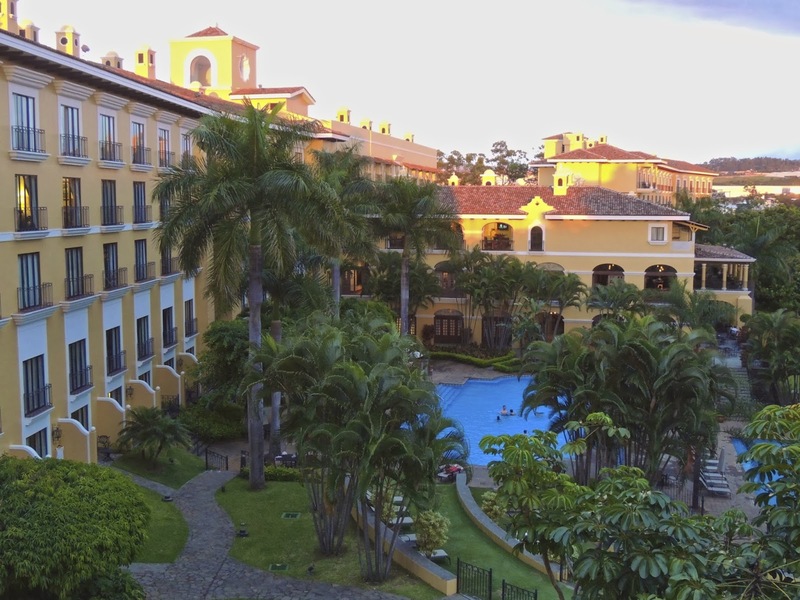 On our first visit to Costa Rica in 2005, we took a tour of the country that started in San Jose. The tour company selected a hotel located in an affluent suburb and we visited places in the surrounding area, but downtown San Jose was not part of the itinerary. Since that first trip, we have always flown into the Liberia airport and did not return to San Jose until a trip about a year ago. We were pleased to find attractions worth visiting. Here is one final photo of the National Theater, showing its ornate front entrance. 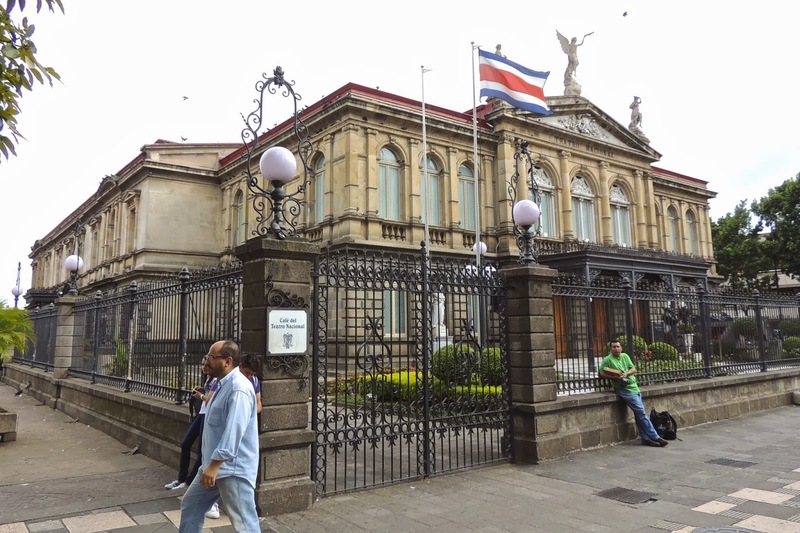 Money from Costa Rican coffee exports enabled such an ornate building to be constructed in the 1890's in a city of less than 20,000 people at the time. I mentioned that President Obama spoke here last May, so I will share a little additional political news. Costa Rica voted in favor of a U.N. resolution to condemn the Russian annexation of Crimea. This is a subject of particular importance to Costa Rica because it does not have a military and relies instead upon international law for protection from its aggressive and militaristic neighbor to the north, Nicaragua. Nicaragua voted against the U.N. resolution that declared Russia's annexation of Crimea to be a violation of inernational law. This has caused concern within Costa RIca because Costa Rica has submittted to the World Court Nicaragua's incursions into Costa Rica. Cosgta Rica hopesnatoi to resolve such matters through inyernational law because Costa Rica renounced the use of military means to resolve disputes more than 60 years ago. This is a view of some of the statuary, both contemporary and classical, in front of the National Theater. The statue against the building is of Beethoven. I took this photo too quickly. I poked my cameral through the iron fence and snapped the photo. I violated one of the cardinal rules of photographic composition. I neglected to check the edges and corners before taking my photo. If I had done so, I would have noticed the modern building and light pole at the left edge. If I had just moved a couple of steps to the left, I could have taken the photo with only the Theater in the background of the front statue, without the distraction of the modern building in the background. Compounding this error, if I had moved to the left I also could have aligned the two statues so they would be closer to one another. Thank you for being my therapist by reading this as I vent my feelings upon looking at this photo. This week we are showing photos of the Perito Moreno Glacier in Patagonia, Argentina, on our Viva la Voyage travel photo site. 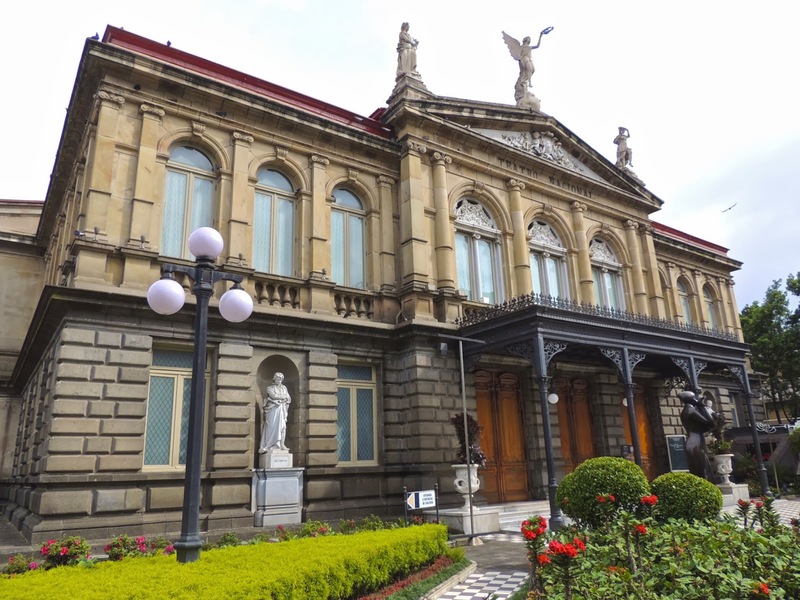 This is a closer view of Costa Rica's National Theater. It was constructed in the 1890's when the population of San Jose was just under 20,000 people. Quite an ambitious achievement for so small a city! The interior is very ornate. It is used for the symphony and other artistic performances. When President Obama visited Costa Rica in May last year, his address to a gathering of Central American economic leaders was held in the National Theater. 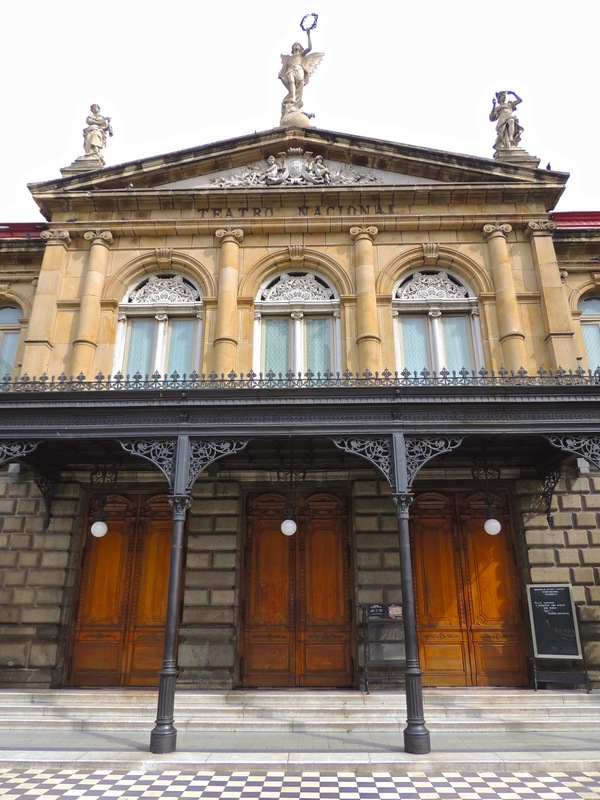 Costa Rica's National Theater in downtown San Jose is a point of pride. It is an architectural copy of the Paris Opera House. I will show photos from downtown San Jose in the coming weeks. The information recorded with my photos reflects that I took this photo exactly 7 seconds after taking the photo that I posted yesterday. 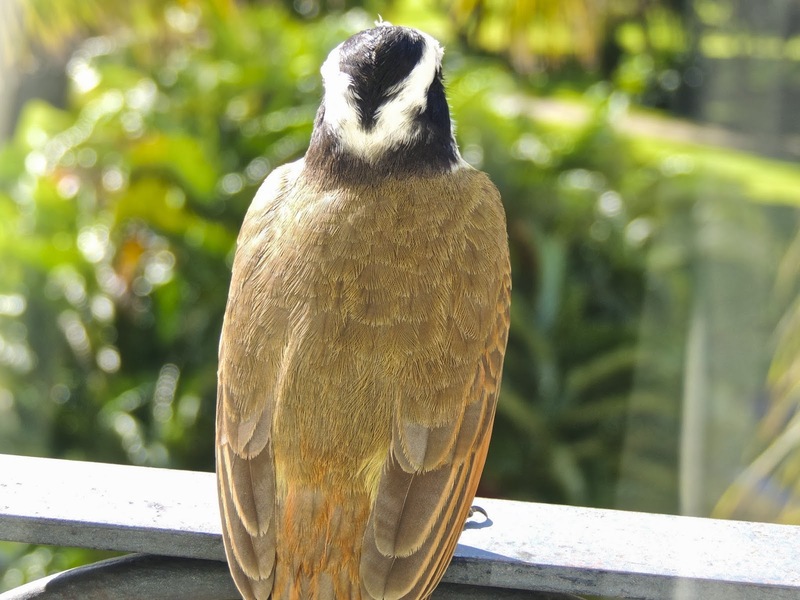 Fortunately, the bird turned his head to reveal his profile so I could get this photo. 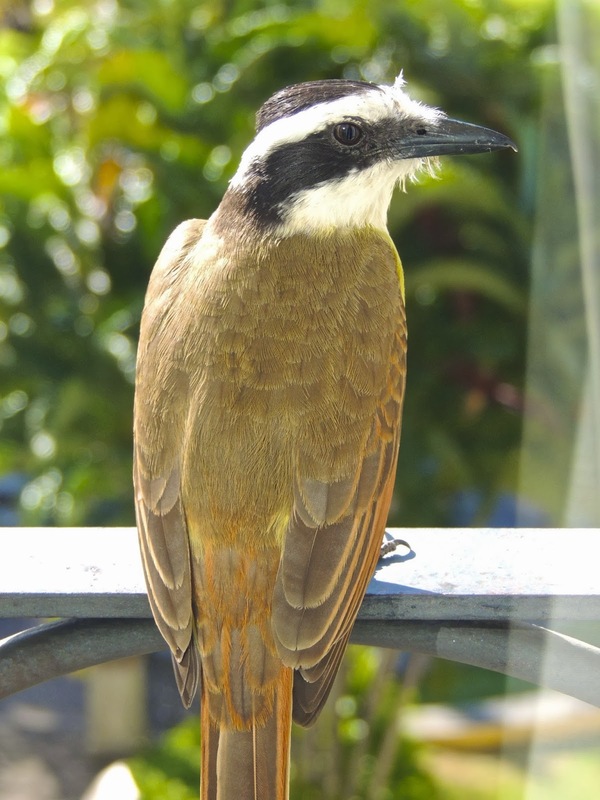 I looked in my Birds of Costa Rica book, but could not find a bird that looks exactly like this. This bird's head looks like a female hairy woodpecker with the black and white stripes, but the face should be black rather than brown, and the beak is not as pointed as it should be for a woodpecker. On the morning after my walk from the Marriott Hotel that I have shown during the pst couple of weeks, I opened the curtains of our hotel room and a few minutes later this bird landed on the railing outside the window. Naturally, I reached for my camera hoping to get a close bird photo before he flew away. I took this photo without waiting to see if he would turn his head to reveal his face. I took this photo from the same place as the photo I posted yesterday. 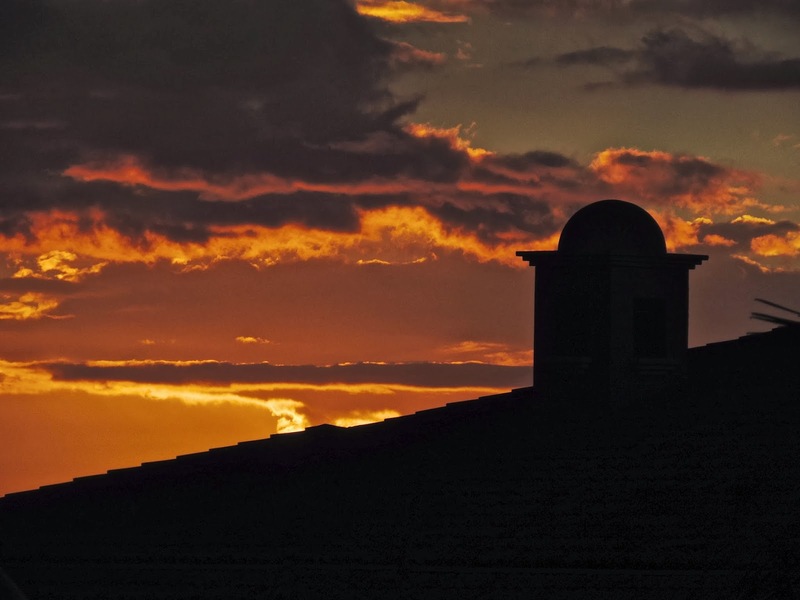 Yesterday's photo was early in the sunset, and I waited for a late sunset view across the roofline for this photo. 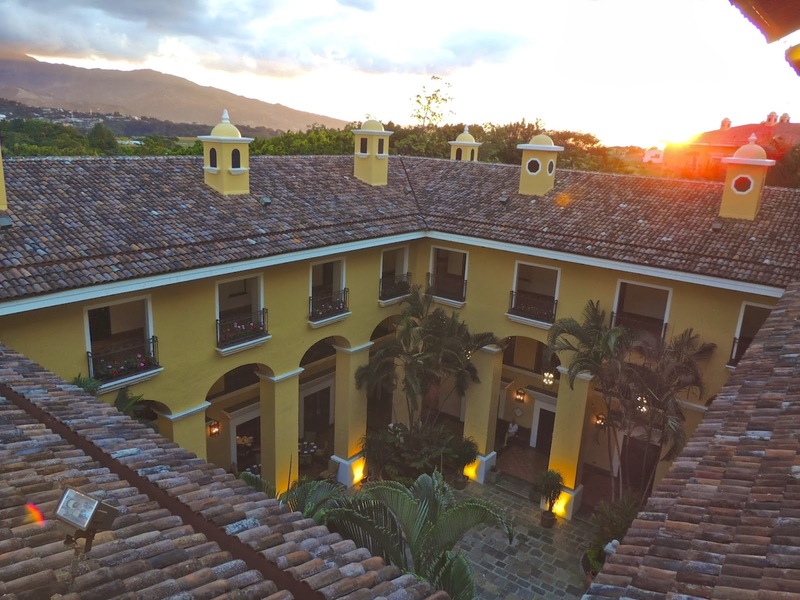 We get spoiled with vibrant, stunning sunsets on the beach in Tamarindo, but apparently they have good sunsets in San Jose as well. Our room at the Marriott overlooked the pool and gardens, but was not positioned to have a view of the sunset. So, after my walk around the area, I walked up to to top floor to find a spot from which I could get a sunset view. I picked this spot above the main courtyard of the hotel. Tomorrow and the following day I will show whether this was worth the effort. Today is Sunday, so we have new photos posted on our Viva la Voyage travel photo site. This week we are showing photos of the Perito Moreno Glacier in Patagonia, Argentina. After my walk throughout the area around the Marriott Hotel near the San Jose airport, including the Mormon Temple and cemetery that I have shown during the last few weeks, I returned to the hotel. I showed the late afternoon sky as I left the cemetery, so I hustled back to the hotel to see if I could catch the sunset from the hotel. It is very late afternoon in this photo, and tomorrow I will show the developing sunset. This week, in recognition of St. Patrick's Day on Monday, we have posted photos of Dublin, Ireland, on our Viva la Voyage travel photo site. 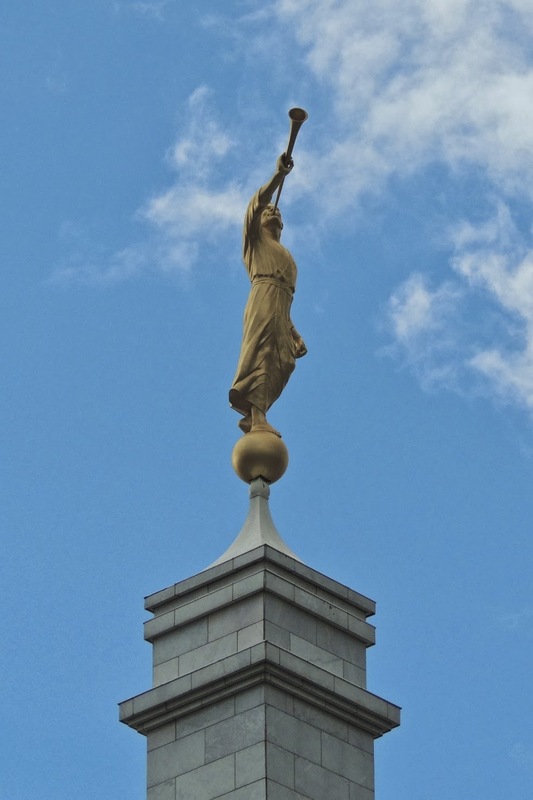 I have been showing some photos of the Mormon Temple that I encountered on my walk from the San Jose Marriott, focusing on the traditional Angel Moroni that sits atop the temple. This is a photo of the Mormon Church that is tucked behind the temple. 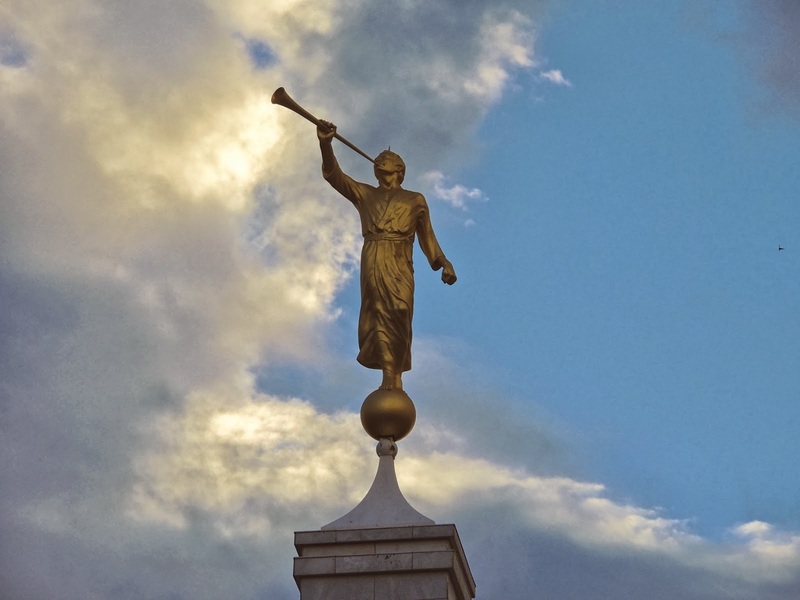 Only Mormons who have been baptized and are otherwise prepared and qualified to go inside the temple are allowed in the temple, but everyone can attend the church. 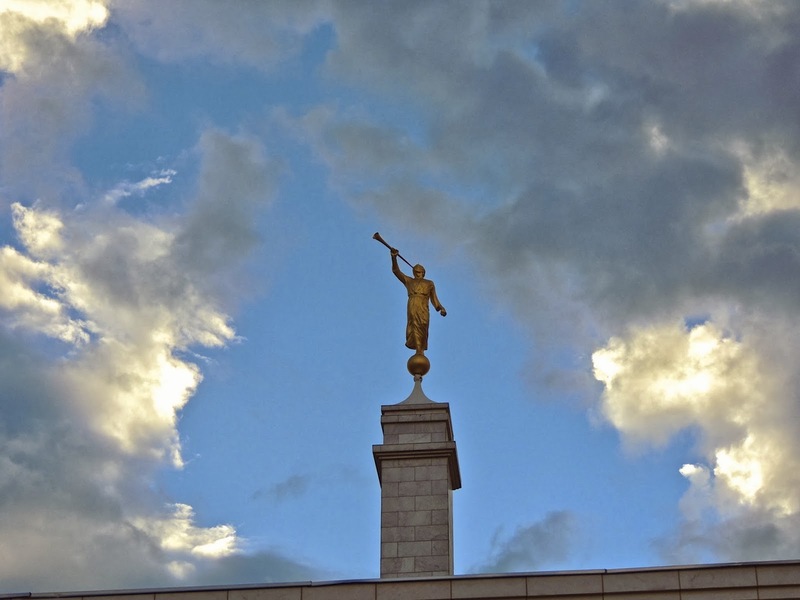 Here is another view of the Angel Moroni against a backdrop of a dramatic, late afternoon sky above the Mormon Temple in suburban San Jose. On my walk back to the hotel, I noticed the late afternoon sky provided some opportunities to maneuver myself around to be able to frame the Angel atop the Mormon Temple with the clouds in the background. 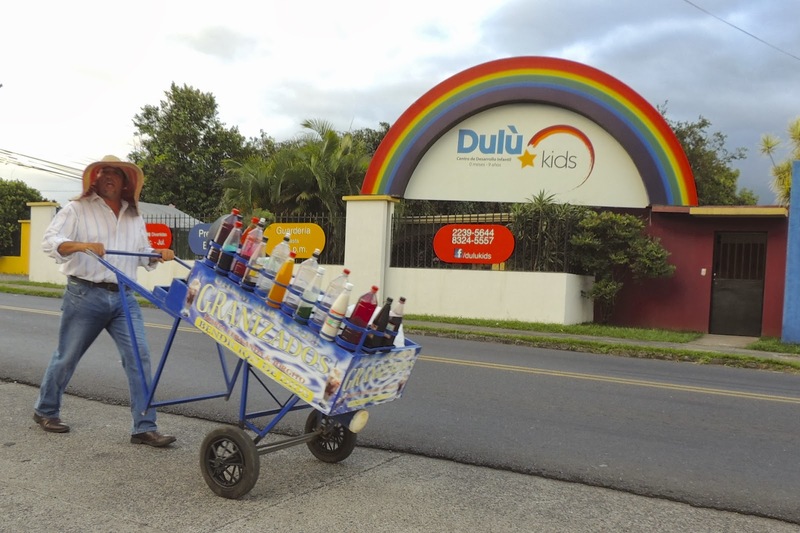 Just after leaving the cemetery to walk back to the hotel, I crossed paths with this drink vendor. It appeared to be a fruit flavored ice drink, similar to a snow cone, without the ice being shaved. This seems like a good business for a warm, tropical country. 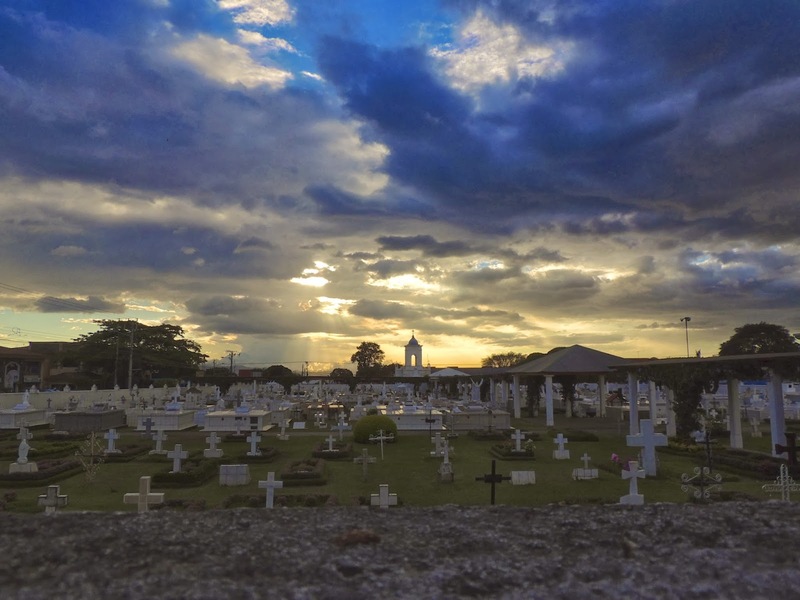 After leaving the cemetery, I decided to walk up to the wall and reached up and placed my camera on the top of the wall to take a photo of the later afternoon sky with the cemetery in the foreground. The wall was too tall to see over, but I was pleased with the scene the camera captured even if I could not see it except through the elevated camera LCD screen. This week, in recognition of St. Patrick's Day, we have posted photos of Dublin, Ireland, on our Viva la Voyage travel photo site. 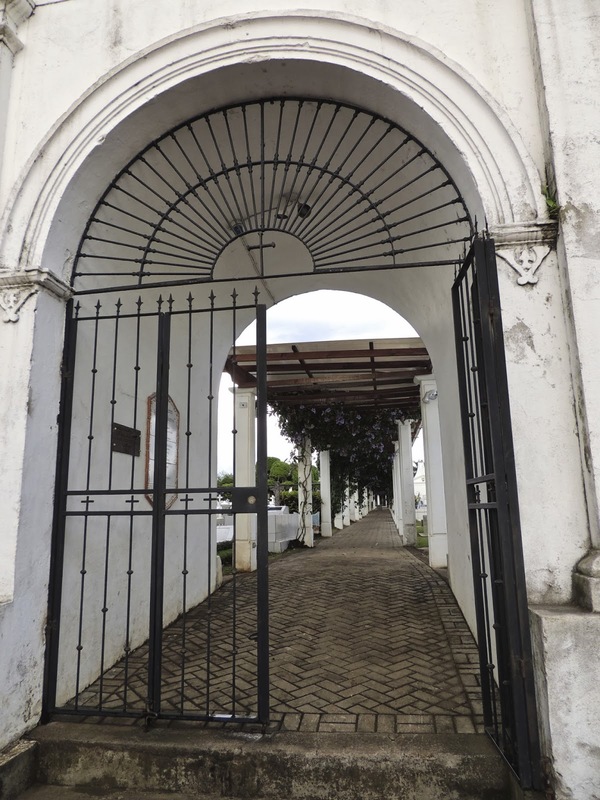 The gate and walkway into the cemetery immediately transforms the mood from the hustle and bustle of everyday life into one of quiet, reflective reverence. Today is Sunday, so we have new photos posted on our Viva la Voyage travel photo site. This week we are showing photos of Dublin, Ireland. 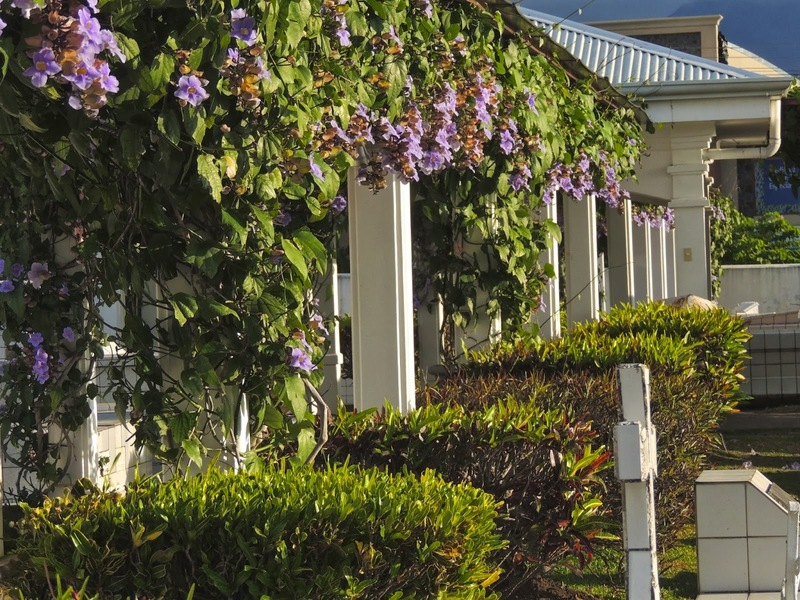 When I began my little series of photos from the suburban San Jose cemetery, I showed the walkway lined with vines and flowers. I am close to concluding the series with the is photo of the arbor catching the last rays of the sun. I had the sweet light of the sun for only about 5 minutes then the sun ducked behind a cloud. Tomorrow I will conclude this cemetery series. Yesterday I shared a little news of a religious nature that traced its origin back nearly 400 years, so today I am sharing some contemporary pop culture. Paul McCartney has added a concert date in Costa Rica. His current world tour will include several stops in Latin America, and one of those will be in the national soccer/football stadium in San Jose. 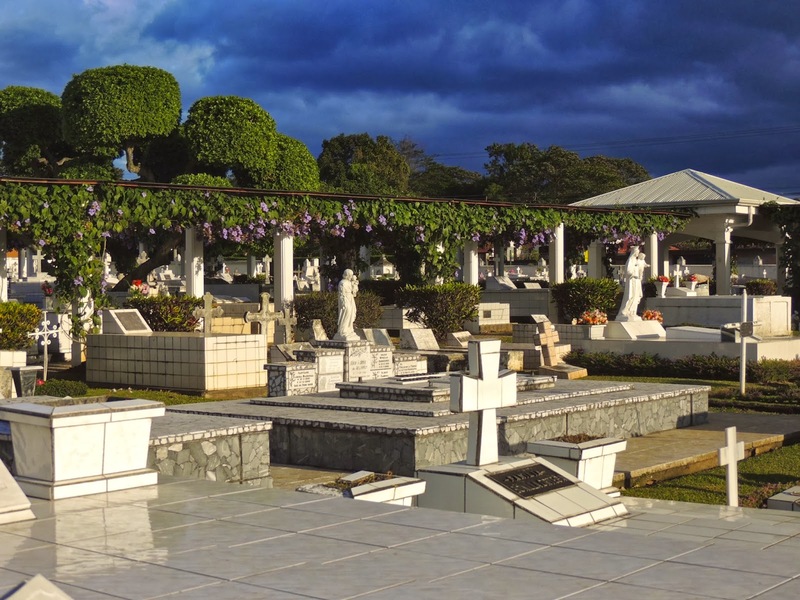 I will use the occasion of this additional photo of the cemetery in San Jose to share some religious news from Costa Rica. At the suggestion of President Laura Chinchilla during her recent meeting with the Pope in the Vatican, the Vatican will soon be displaying a statuette that is a replica of the patron saint of Costa Rica, the Virgin of Los Angeles, also known as La Negrita. The statuette will be displayed on a marble base in St. Anne's Chapel in the Vatican. 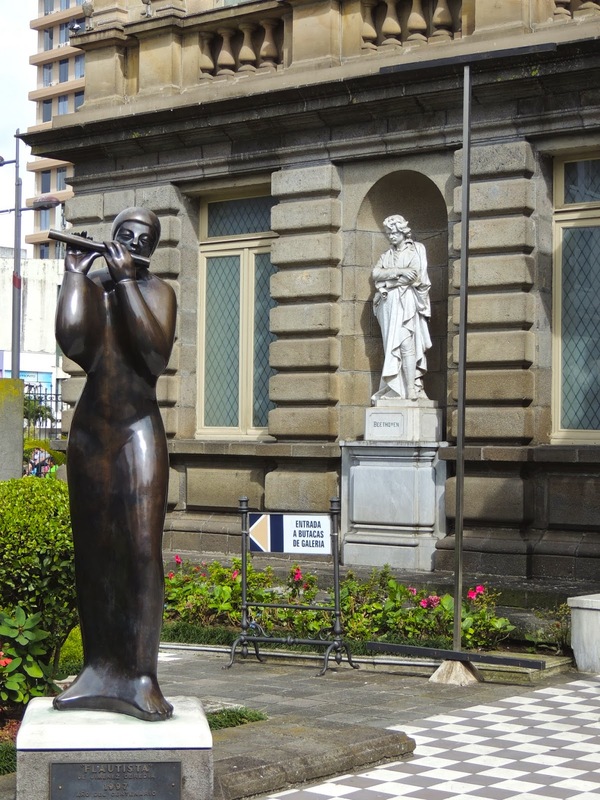 The original statue of the Virgin is kept at the spot where it first appeared and reappeared in Cartago, where a Basilica stands to commemorate the event. This week we are showing photos of the people of the Sepik River, Papua New Guinea on our Viva la Voyage travel photo site. This is a telephoto shot from the cemetery looking towards the Mormon Temple. The Angel Moroni on top of the empale, which was barely visible in the photo I posted yesterday, is prominently featured in this photo, with the two blocks of space between the cemetery and the Mormon temple compressed. Duality is a common theme in Latin American cultures. In this photo, the angel in the cemetery is echoed in the distance by the Angel Moroni, which is on the top of the Mormon Temple and is visible in the distance near the center right of this photo. The two photos I am showing today is another example of the difference that different lighting conditions can make in only a few minutes of time. My wife and I travel at times on our own, and at times we take group tours, and sometimes we take photo tours. A challenge and at times frustration of taking a group tour can be that at the time we are visiting a place that would make a great photo, the light may not be right, and there is not time to wait for better light. Of course it is not possible to plan the itinerary of group tours for the best lighting conditions, nor would it be fair for other tour members to wait for the best light. On photo tours, often there are visits to scenic places planned for the first light in the morning and last light in the afternoon, and the other travelers are usually also interested in waiting for the best light for photos. I walked around taking photos of the monuments in the cemetery for a few minutes, including the photograph at left. Then, after a few minutes the late afternoon sun broke through the clouds and cast a golden light on the cemetery. I quickly walked around the cemetery and took another set of photos of the same scenes that I had already photographed, but in better light. The second photo below was amen exactly 10 minutes after the first photo. What a difference the light conditions can make just a few minutes apart. Tomorrow I will show an even more dramatic illustration of the difference in lighting conditions. 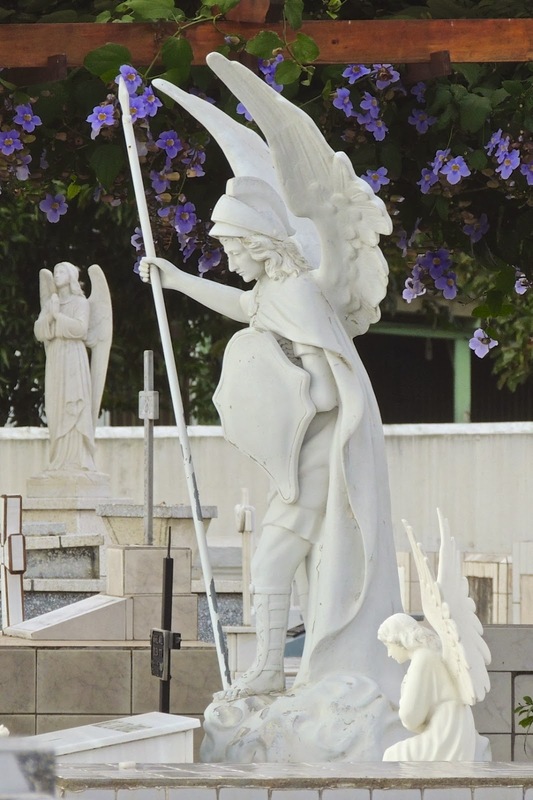 Cemeteries with above-ground memorials and statuaries provide photo opportunities to align up angles among the statuary, as I hope I accomplished with the composition of this photo. 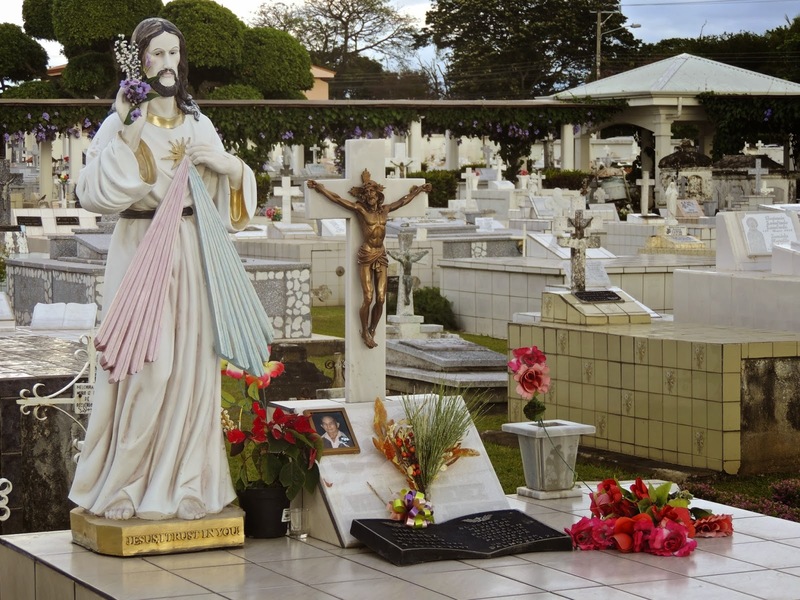 On our travels we will at times enter cemeteries to photograph the memorials and pay reverent tribute to the culture of the local population. 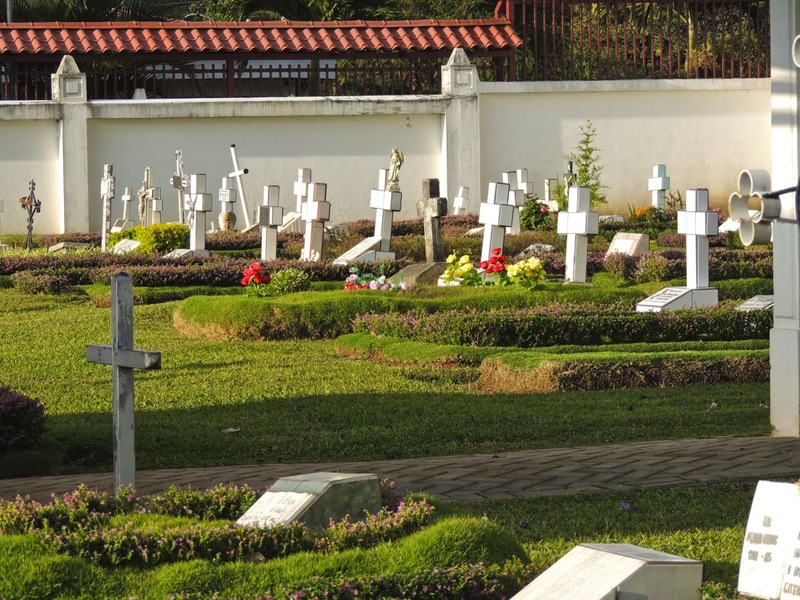 Cemeteries are a window into the culture, as memorials can reflect the faith and values of families. 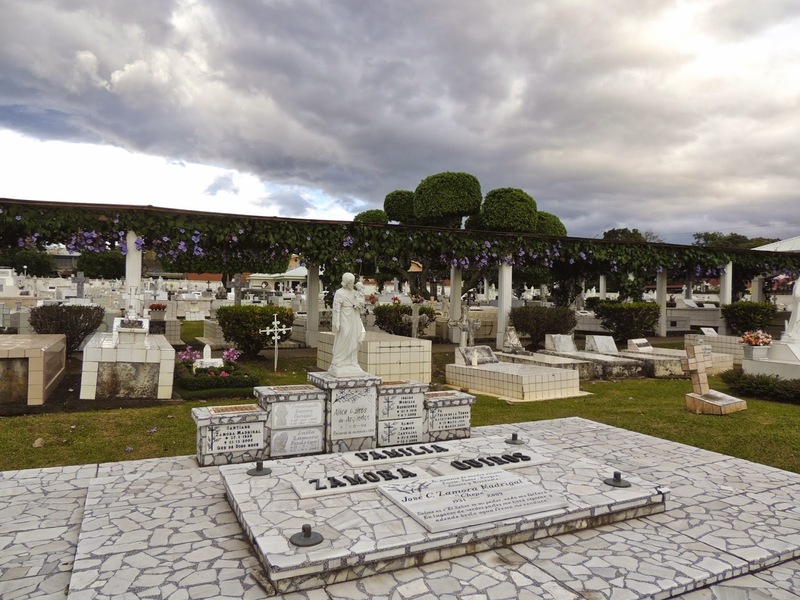 The cemeteries in Latin America are particularly compelling. 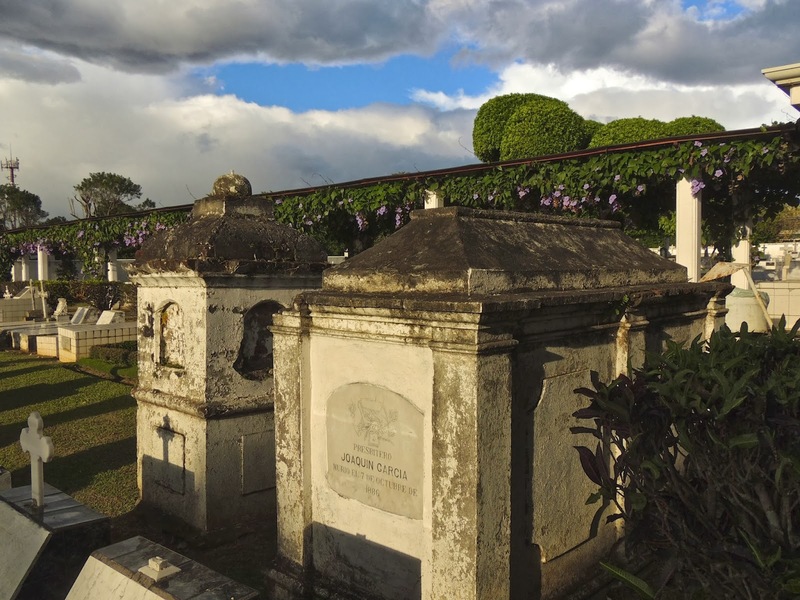 The Recoleta Cemetery in Buenos Aires is the most impressive that we have seen, and it is a major attraction for visitors, domestic and international. Today is Sunday, so we have new photos posed on our on our Viva la Voyage travel photo site. This week we are showing photos of the people of the Sepik River, Papua New Guinea. This is a photo of some of the graves within the suburban San Jose cemetery that I encountered on my walk. Costa Rica is obviously a very Roman Catholic country. Each year as many as one million people make a pilgrimage to the cathedral in Cartago during a holy week in August. That is about one-fourth of the country's population. 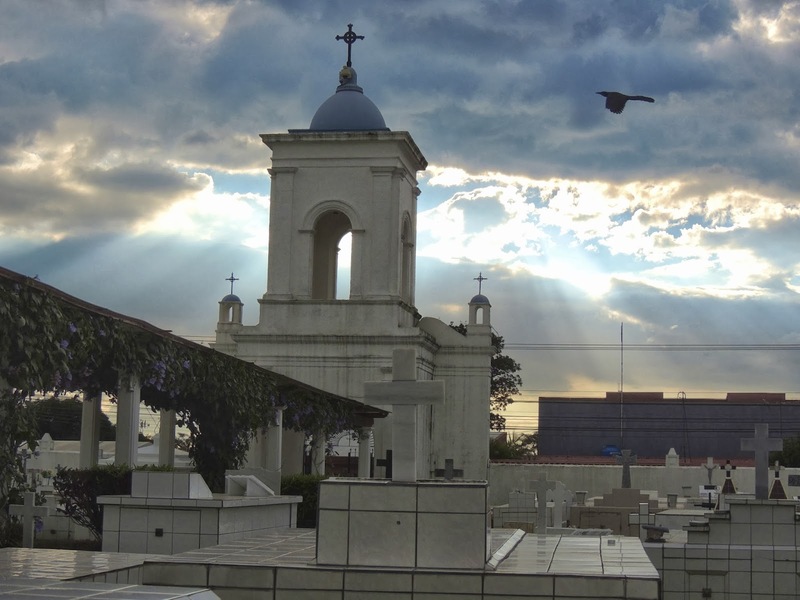 The photos I have been showing the last few days have been from a cemetery that I came across on my little walk from the San Jose sanMarriott. 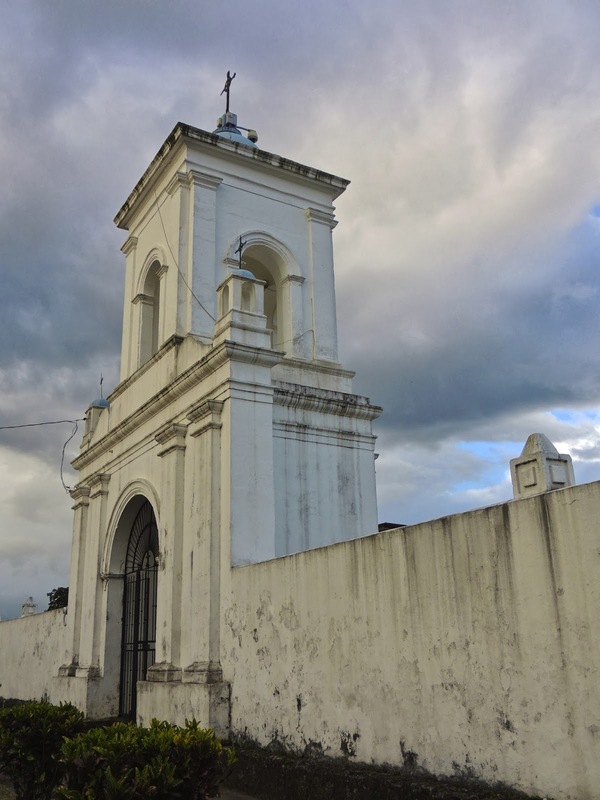 The front entrance to the cemetery had the architectural features of a Spanish colonial church. Some of the tombs hae statuary. I will show a few more photos from my walk around the cemetery. 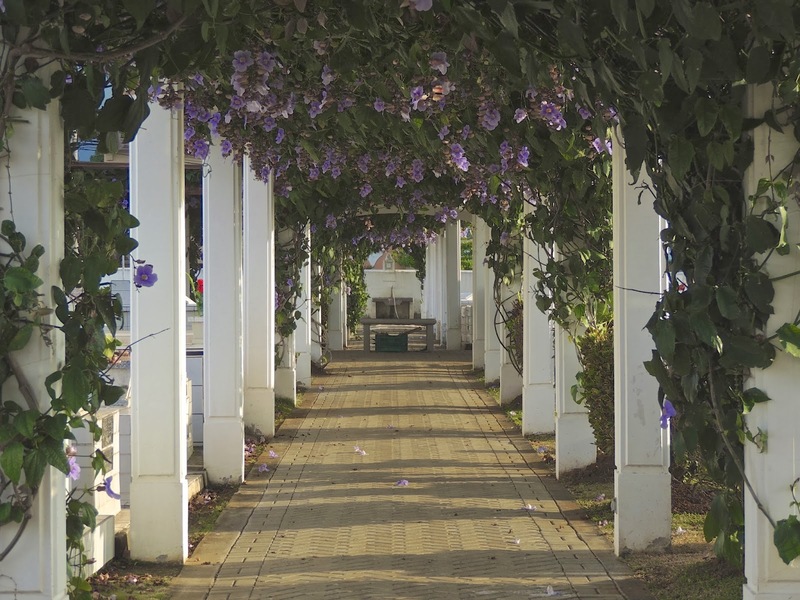 Walking through the gate shown in yesterday's photo revealed this flower-covered walkway. Tomorrow I will show what the rest of this place looked like. After I walked passed the Mormon Temple, I next came upon this scene. This looks somewhat like a church. Tomorrow I will show what is inside, behind these tall walls. Just down the road from the Mormon Temple was this scene. What would have been a very ordinary. 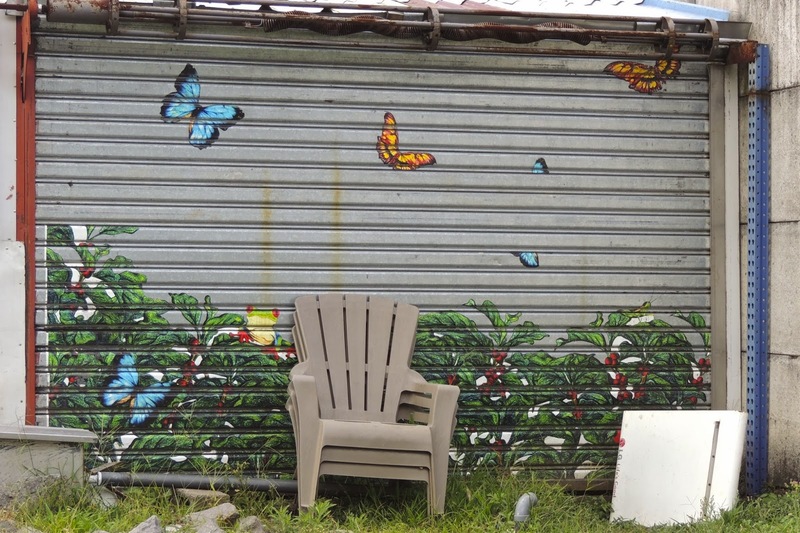 old, seldom-used, roll-up type of metal door was decorated with a tropical theme, with painted plants and butterflies. 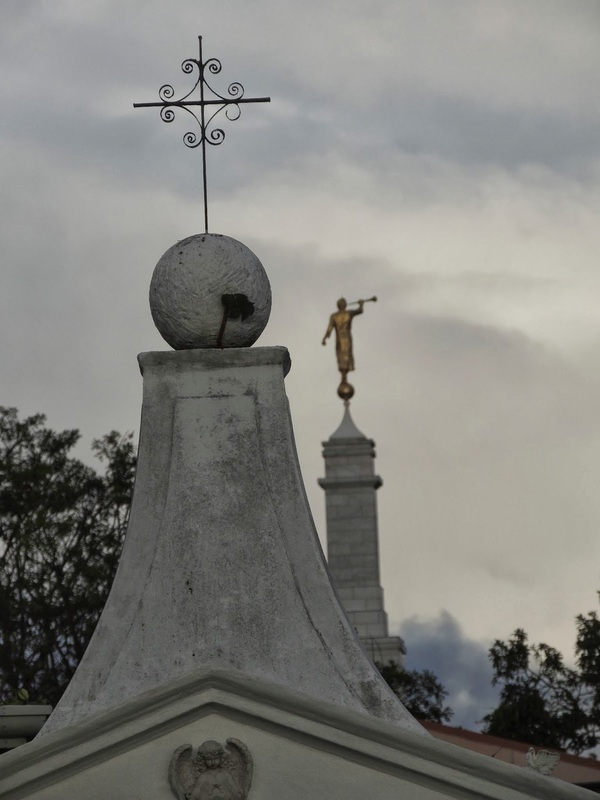 When I took my little walk in what appeared to be a rather ordinary suburban San Jose neighborhood, you can imagine my surprise in seeing the Angel Moroni atop the spire of what I knew must be a Mormon Temple. 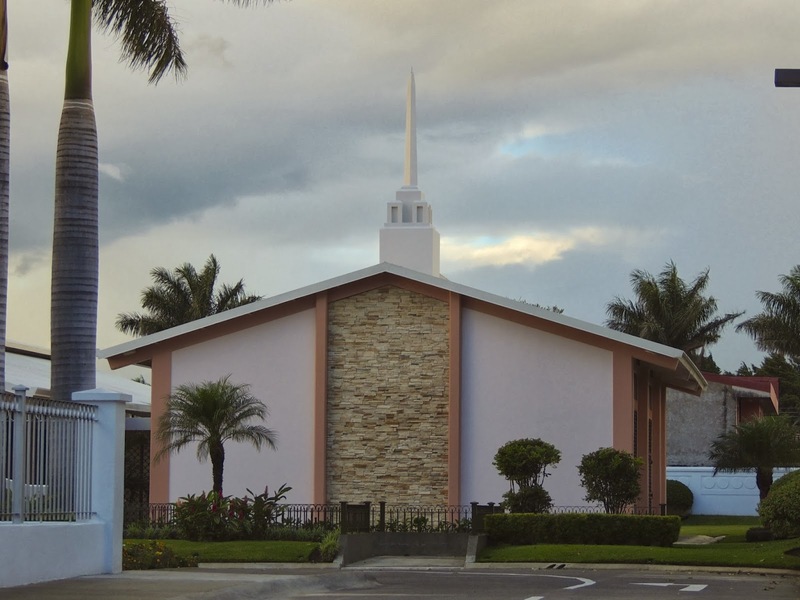 The Church of Jesus Christ of Latter Day Saints, also known as the Mormon Church and often abbreviated by its acronym "LDS," is growing in Latin America. I have heard that there are now more LDS members in Latin America than in the USA, its origin. 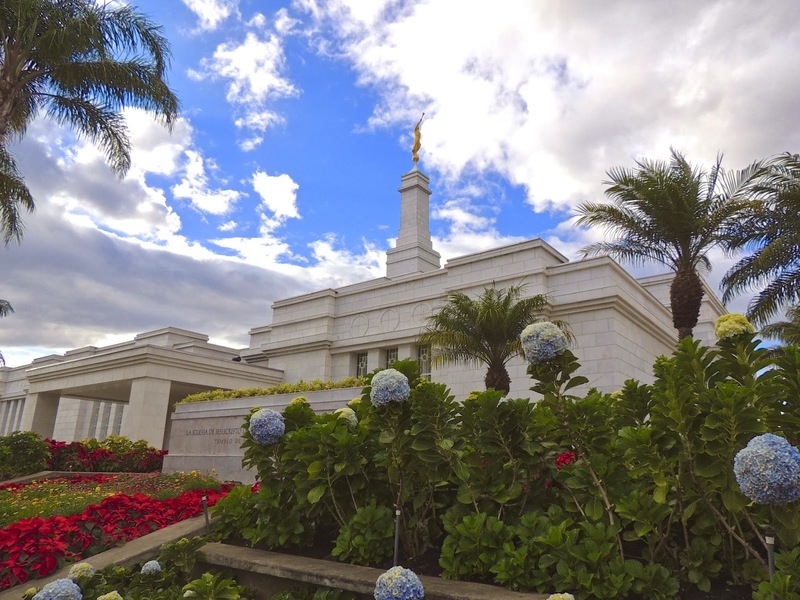 This is a fitting weekend for me to feature the San Jose LDS Temple because in Arizona, where I live when not staying our one of our condos in Tamarindo, this weekend was the dedication of the new Mormon Temple in Gilbert, a suburb of Phoenix, Arizona. The Phoenix area has the second largest LDS population, after the Salt Lake City, Utah, area. That is one of the reasons that the Mormon Church has supported inclusive views on immigration. The anti-immigration initiatives originating in Arizona have been opposed by many in the church because of the detrimental effects on the church's missionary work in Latin America. After walking past the houses, stores and restaurants that I have shown recently, you can imagine my surprise at coming across a building with this figure on top. As I approached from a distance, I knew instantly what it was. I will show the building tomorrow, but thought I would refrain from identifying it today to create a little suspense just in case some readers may be unfamiliar with b buildings with this feature on top. Today is Sunday, so we have new photos posted on our Viva la Voyage travel photo site. This week we are showing some additional photos from our recent trip to the Galapagos Islands. Theme Day: People on the "Street"
The worldwide Daily Photo theme for March 1 is People on the Street. 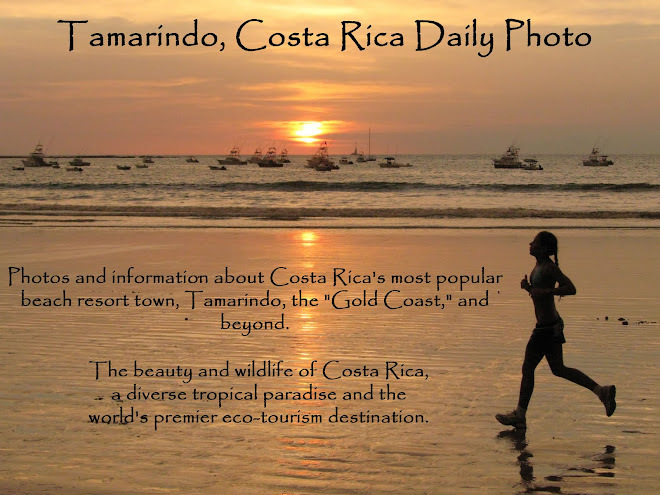 In Tamarindo, we do not have very many streets or people on the street. We have more people on the beach and in the ocean. So, I thought for my interpretation of the theme, I would show a photo with a lot of people enjoying the ocean at the Playa Langosta area of Tamarindo. To see how other Daily Photo bloggers have interpreted today's theme, click on this link.